Nestled into the base of South Mountain, The Legacy sits on the most historic Dwight B. Heard estate in Phoenix, Arizona. Part of The Legacy Golf Resort, our many indoor and outdoor venues, along with our historic Sierra Vista House and surrounding grounds, provide an ideal setting for any special event. Let our team take care of all the details to eliminate all worries, so that you can focus on the fun and excitement of your big day. The Legacy is full of beautiful venues and options that will exceed all your expectations for both ceremony and reception sites. Our indoor venue options range from seating capacities of 80 to 250 people, and our outdoor options can host up to 300. We prefer catering in-house and work with a number of local vendors to provide fresh, delicious food your party will rave about, but also welcome outside caterers if desired. Multiple beautiful venues for wedding ceremonies and receptions allows us to appeal to all tastes and styles, making every event and unique and memorable experience. The convenience of being a part of The Legacy Golf Resort allows guest the opportunity to stay on-site, relax, and enjoy themselves without having to get caught up in the typical hustle and bustle of a wedding or big event. Leave the details to our team, and allow yourself to experience all that The Legacy has to offer! Arizona Broadway Theatre is located on the west side of Phoenix nestled in the heart of Peoria's P83 entertainment district just off the loop 101 and Bell road. There are three areas accommodating special events: - The Encore Room is a 5,000 square foot banquet facility with two tiered seating, wood floors, theatrical lighting, sound system, stage, dressing room and seating for 250 people. - The Main-stage Theatre is a multi-level stadium with seating up to 450 people with lights, sound and perfect view of the stage no matter where you sit. Perfect for a presentation with lights, sound and superb acoustics. - The spacious and beautiful front lobby offers an array of seating options ideal for brunch, lunch, receptions and formal dinners for up to 300 people. Arizona Broadway Theatre has a full-service kitchen and bar dedicated to catering services. Food and beverage packages include options ranging from a simple breakfast to an elaborate formal dinner. Options include lights, sound, entertainment, photography, cakes, centerpieces, linens and equipment rental services all available on request. For more information call, text or email to communicate with our event planner. Miele's has been a family owned and operated restaurant since 1995. When you come in, you can expect great food, great service and a friendly neighborhood environment. We want you to feel at home right when you walk through the door. We will sit down with you and make every effort to make your event perfect. Unlike other restaurant banquet rooms, we do not limit you to choices from our menu. Just let us know your heart's desire and we will do everything in our power to accommodate. Even if the request is a dish that is not of the Italian persuasion. Mesa Country Club is an ideal wedding ceremony and reception venue for anyone in Tempe, Mesa, Chandler, South Scottsdale or East Phoenix. Perfectly suited to accommodate magnificent large celebrations as well as unforgettable intimate events, Mesa Country Club provides a variety of stunning indoor and outdoor spaces to create the wedding of your dreams. With the sophistication of a storied private club, Mesa Country Club perfectly melds striking views, a convenient location, flexibly-priced menu options, and a 60+ year heritage as we make your dream day a success. Menus are planned and executed to perfection by our culinary team, and all details are personally cared for by our staff, giving you the freedom and peace of mind to truly enjoy your special day. PLEASE NOTE: You do NOT need to be a Member of Mesa Country Club to enjoy our exceptional wedding & event facilities. 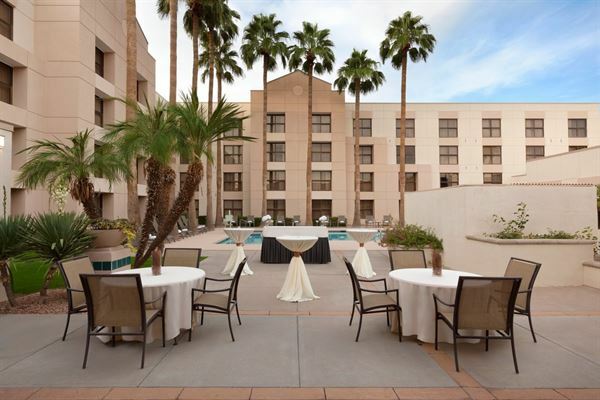 A beautiful Scottsdale wedding & event venue offering a lush green ceremony location, exceptional food and both Patio receptions and a beautiful Grand Ballroom with space to accommodate up to 400 guests. Events at 94 HUNDRED SHEA is a UNIQUE AND RUSTIC STYLE EVENT VENUE. A PRIME, CENTRAL LOCATION IN NORTH SCOTTSDALE. We’re located just 1 mile North of the L-101 and Shea Boulevard in the lively and upscale North Scottsdale area. With a wide variety of nearby hotels, retail shops, restaurants and entertainment, North Scottsdale is the perfect weekend getaway for your local and traveling guests. PLAN THE EVENT OF THE YEAR. We host corporate events, holiday parties, awards banquets, proms, non-profit fundraisers, product launches, film and photo shoots, corporate meeting and networking receptions in addition to engagements, birthdays, anniversaries, graduation, Bar and Bat Mitzvahs. Nestled beneath the serene, sun-drenched hills of North Phoenix lies a lush, green, oasis in the desert called Moon Valley Country Club. This classic 160-acre property is laden with mature trees and foliage which rise above the colorful flowers that adorn the landscape. Awarded the Best Private Club Clubhouse Renovation for 2009 in Golf Inc. magazine, we can assure you that our location will leave a lasting impression and wonderful memories. Allow our experienced Special Events Team and innovative Executive Chef to lead you along as you plan the most magnificent day of your life. We are Social Tap. The premiere destination for private events in Old Town Scottsdale. We have a strong emphasis on house-made American and Mexican cuisine with a focus on local craft beer. We believe that good food and drinks are meant to be shared with friends. With over 24 beers on tap, craft cocktails, and our scratch made menu, we can accommodate any size group and gathering. We are here to help you throw an amazing event whether it’s a business meeting, a casual gathering, or a formal celebration. Social Tap has four spaces available that can accommodate anywhere from 15-450 people. Flexibility paired with quality service are hallmarks of our private dining events. Our staff will work with you to ensure every details is taken care of before your guests arrive.